One down, two to go as the Seahawks show us who they really are for the home stretch. The 28-14 win in Detroit showed they can beat a good team in its place (Carolina, take note). Next, the Hawks need to show they can beat a better team (the Chargers) in Seattle (so Green Bay, Minnesota and Kansas City can take note). And then the Hawks will get a chance to show us they can beat the NFC’s best on the road. That style is predicated on running the ball, getting big plays in the passing game and winning the turnover battle. The Seahawks have averaged 173 rushing yards over the past four games. That includes 176 yards on 42 carries in Detroit — making Russell Wilson’s Seahawks 11-0 when running it 40 times. 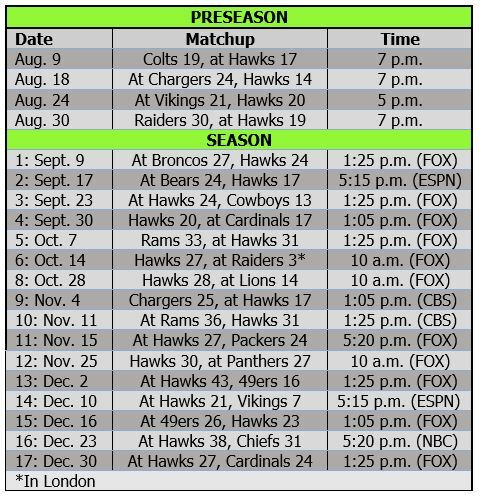 The Hawks also pulled three more takeaways, putting them at plus-10 for the season — which leads the NFL. Along with allowing a season-low 34 rushing yards, the defense did its job well enough despite giving up 310 passing yards and 6 of 10 third downs. 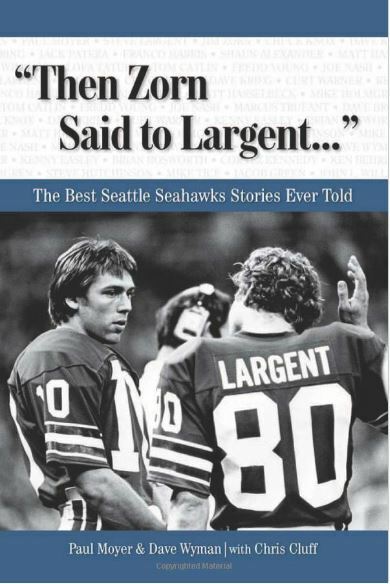 And Wilson put up the first perfect passer rating in team history while also averaging a team-record 14.59 yards per attempt (Dave Krieg averaged 14.52 in a 34-24 win over San Diego in 1986). Wilson has thrown 16 TD passes, putting him on pace for 36, which would break his team record of 34 (2015, 2017). 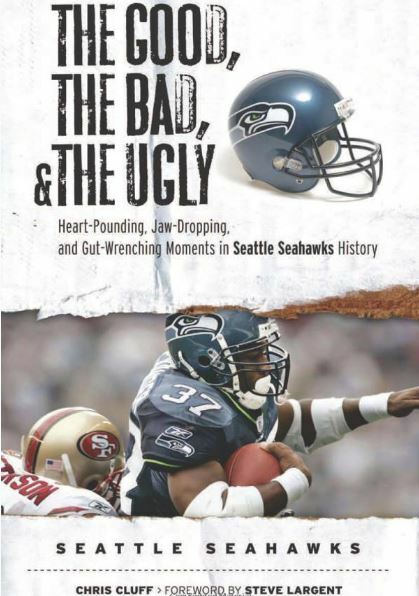 And it’s all rooted in the running game — just like it was in the 2012-14 seasons, when the Hawks were true contenders. This team is using the same formula it used in 2014, when it set a team rushing record and used stellar defense to win eight of the final nine and advance to the Super Bowl. The win in Detroit is a good sign the Hawks might turn into that kind of team — the next two games will tell us for sure. As for the NFC West, with the Rams (8-0) beating the Packers to remain perfect, the next three weeks provide what likely is Seattle’s only chance to close the gap. The Rams play three of the NFL’s best teams the next three weeks: the Saints (6-1), Seahawks and Chiefs (7-1). If the Rams were to somehow drop all of those, they would be 8-3. If Seattle were to also win its next three — vs. the Chargers, Rams and Packers — it would improve to 7-3 and sit just a half-game back. The Seahawks then could catch up with a win in Carolina, and it would come down to which team was able to run the table over the final five. It’s definitely a long shot for the Hawks to make up 3.5 games in the division, but they’re certainly looking good for the postseason — in the sixth spot right now. It all comes down to whether they can sustain the formula the way they did in the 2012-14 seasons. In fact, Wilson said, “It really reminds me of 2012, when nobody was really thinking anything and you had young guys who played great and veterans who played great. There’s nothing that we can’t do.” The Hawks went 11-5 in Wilson’s rookie year, using all of the same strengths they have now, and came up just shy of the NFC title game. Carroll dedicated the win to Paul Allen and said they will continue to play in his honor. The Lions showed respect and class by holding a moment of silence, too. The Dicksons had intriguing games — “Big Balls” Michael with the Aussie Sweep and Ol’ Ed with a couple of big plays in his Seahawks debut. Tyler Lockett and David Moore each scored again and now have a combined 10 touchdowns. Moore had a career day. Bobby Wagner reveled in beating Golden Tate and the Sea Lions. The safeties had some issues in coverage (Carroll told 710 ESPN they need to work on Cover-2 zone more to learn how to play certain situations). Impressive win, by any standards. Give Russell decent protection and a running game, and he is as lethal as any QB in the NFL. Games like this remind me of my original assessment of him — a mobile version of Bart Starr. QQ: Should Vannett’s TD have been waved off? I know that he went out and came back in, but the replay made it look like he was shoved out (as opposed to being “run” off his route by a defended taking position). This happened in front of a zeeb and there was no flag; still it seemed odd. Refs tend to ease off calling shoves when the QB is scrambling. The TD wouldn’t have counted even if a flag had been thrown, though probably a first down. Vannett really just needed to know where he was in the end zone. On his show this morning, PC compared Russell to Bart Starr. I am vindicated! Great to see KJ back in action. I can forget just how good he is and how much he means to the the defense. I continue to be concerned about Baldwin.